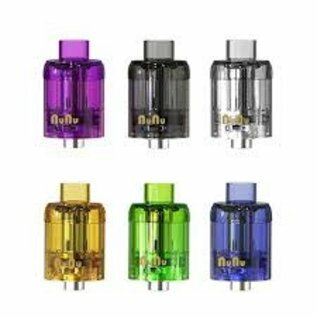 Can't decide on a sub-ohm tank and what something without all the crazy bells and whistles? Grab the New NuNu Disposable Tank, a 24mm, 3mL E-Juice Capacity Sub-Ohm tank designed to be thrown away with the end of the coil. It features a bottom airflow and completely sealed design, and is filled with a super simple top-fill opening for maximum accessibility. The NuNu also features the usage of a 0.15Ω ohm Mesh Heating Element and bottom airflow for maximum flavor and longevity. Completely sealed except the hole on the top to fill E-juices, which means no leaking. A tank for a price of a coil.